"In crystalline text steeped in cold rage, Sayer takes aim at the REF's central claim, that it is a legitimate process of expert peer review. He critiques university and national-level REF processes against actual practices of scholarly review as found in academic journals, university presses, and North American tenure procedures. His analysis is damning. If the REF fails as scholarly review, how can academics and universities continue to participate? And how can government use its rankings as a basis for public policy?" "Sayer makes a compelling argument that the Research Excellence Framework is not only expensive and divisive, but is also deeply flawed as an evaluation exercise. Rank Hypocrisies is a rigorous and scholarly evaluation of the REF, yet written in a lively and engaging style that makes it highly readable." Few decisions are as consequential for the funding and reputation of Britain's universities as those of REF panels. Not only do REF rankings determine the levels of research funding universities receive from the state. They equally affect institutions' ability to attract external grants, top-flight faculty, and graduate students. Whatever benefit the UK's periodic research assessment exercises may have brought to research productivity, the REF has been widely criticized for its enormous costs in taxpayers' money and academics' time, its discouragement of innovative (and especially interdisciplinary) research, and its negative effects on collegiality and staff morale. Derek Sayer extends these arguments, notably through his discussion of the questionable staff selection processes used in REF2014 within his own university. Where Rank Hypocrisies goes beyond previous critiques is in its open challenge to the REF's claim to provide 'expert review of the outputs' - the very heart of its legitimacy. 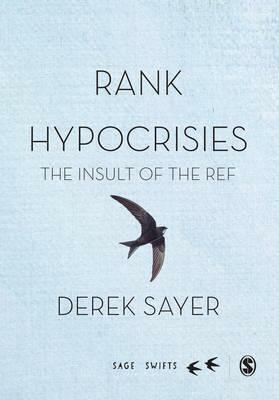 Examining the composition and operation of REF disciplinary subpanels in forensic detail, Sayer paints a picture in which overburdened assessors assign vaguely defined grades in fields that are frequently not their own while ignoring all external indicators of the academic influence of the publications they are appraising, and then shred all records of their deliberations. Judged against international norms of peer review, the REF is an elaborate charade - and an insult to the core values of the academy. Derek Sayer is Professor of Cultural History at Lancaster University and Professor Emeritus (Canada Research Chair) at the University of Alberta. His most recent book is Prague, Capital of the Twentieth Century: A Surrealist History (2013). He is a Fellow of the Royal Society of Canada.